Hot off the press – Cantabile won their class at Cheltenham despite some great performances by their fellow competitors. Everyone elated but tired as many of them are preparing for exams this term, so well done! This entry was posted in Competition and tagged Cantabile Girls Choir on May 7, 2013 by cantabilegirlschoir. Cantabile will be competing with other School Choirs at the Cheltenham Festival of Performing Arts in the Cheltenham Town Hall on 7th May 2013 about 7:00 pm. The calibre of entries is expected to be very high and the choir is looking forward to what promises to be an exciting class! 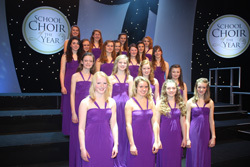 This entry was posted in Competition, Events, Festival on May 6, 2013 by cantabilegirlschoir.